← Day 2: KRISHNA’S COUNSEL – PLEASE NOMINATE ME ON KINDLE SCOUT!!! 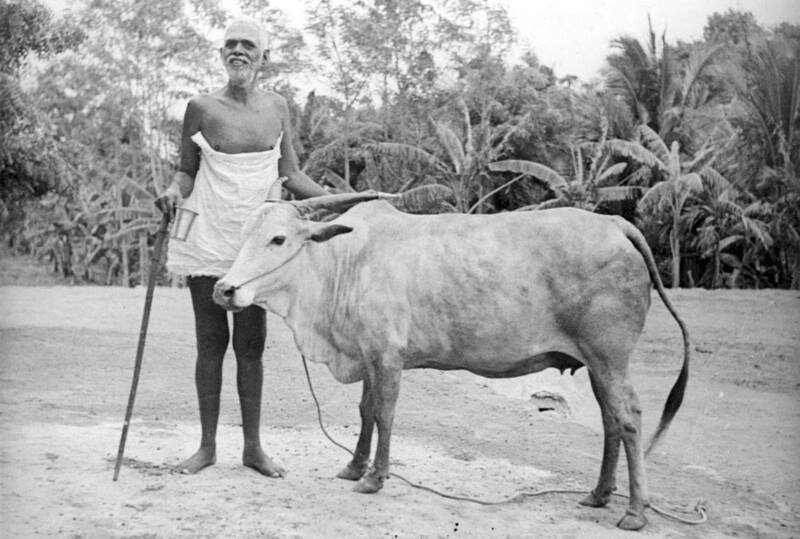 Ramana Maharshi’s last words were “have you fed the peacocks?” His love for animals and indeed all creatures is the stuff of legend – and yet another reason why I adore the Sage of Tiruvannamalai. The knower of wisdom resides in Absolute reality where every being is perceived as divine. To keep this great truth constantly in mind – no matter our current state of consciousness, likes, dislikes, biases and preferences – can slowly or quickly lead us to the wonder of realizing who we are in truth – the immortal and blissful Self. Thank you Harsh Luthar, for this profound post! You pay me a compliment I don’t as yet deserve, dear Harsh! But maybe someday…we will all merge in blissful nondual space. Om Arunachala! If innocence and being present are prerequisites for Heaven, there is no reason that many animals are enlightened. 1. Admitting women in his ashram. 2. Building a temple (for his mother) in a graveyard and doing Hindu pooja there. 3. Not taking sanyasa or initiation in the formal/traditional manner. 4. Not giving sanyasa/upadesa in the traditional manner. That is, not accepting disciples as a guru. 8. Meeting women during their monthly periods. 10. Saying that there is no God outside the Self. 11. Allowing non Hindus (including westerners) to participate in ashram activities and reside in the ashram. 12. Animals…..well it has been covered by Harsha. Well, time ran out just before I could think of the 12th item. The truth is that as a great realized master, Bhagavan had little use for tradition. Though he tolerated certain traditional practices mainly for the sake of those around him, let us not allow him to be swallowed by the traditionalists as own of their own. “The great sage of Advaita, Ramana Maharshi, was born into an orthodox Brahmin world that honored the caste system. And yet Ramana, a jnani who had permanently transcended body and mind, dwelled in the radiant truth of Oneness and refused to buy this. As a young swami living on Arunachala, he often broke caste rules by accepting food cooked by lower caste women. His orthodox mother was horrified by his behavior, whereupon Ramana mocked her for being narrow-minded. Now why would a sage do this to his own mother? Because he loved her so greatly that he wanted her to deeply understand the truth of Oneness; Ramana knew that if his mother did not break free of her destructive conditioning, she would never be able to enter the portals of Moksha or liberation. And yet, like Gautama Buddha, Ramana did not openly exhort others to break free of their traditional moorings, nor did he emphasize the need for social reform (he lived during British rule in India). Why? Because social reform belongs to the realm of relative reality and pales in comparison to his greatest wish for all those who sought freedom from the matrix—which is that we use our precious energy to dismantle once and for all the relative dream spun by the great enchantress Maya. When we seek permanent freedom from the claustrophobic matrix we are caged by, we are operating at our highest level and not just us but all beings benefit from our luminous quest. Thank you for your response, Vish, I find your list most valuable.